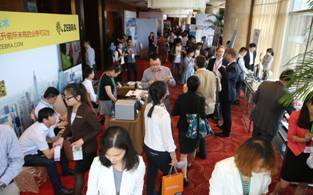 The 7th Asia Pacific Commercial Real Estate Cooperation Forum China 2015 (APCREC7) has been a great success on 21st-22nd May, organized by Linver Insights, supported by Gold Master CBN and Fortune Generation in Shanghai Marriott Hotel Luwan. Over 400 professionals and elites in across the whole commercial property value chain gathered in APCREC7. 36% of them are from property owners and developers (group decision makers and head of leasing and operation department); 24% are brands and retailers (head of expansion in China); 13% are from architecture and design agencies; 10% are from leading commercial property consultants/e-commerce companies and 11% are from product/software solution providers. Property developer delegates are from Fosun Property Holdings, COFCO Land, KWG Property, Citic Real Estate, Central China Real Estate, Fantasia Commercial Management, CIFI Group, Shui On Land, Jinke Property, Yuexing Commercial, etc. Brands/retailers delegates are from Big Cyber, Blk Market, The Fashion Door, Chia Tai Membership Club, Yanjiyou, Blue Frog, Maan Coffee, Shoemarker, etc. Design delegates are from ECADI, WDCE, GDF International, IMG3 Design, Creative Design International, PDAS, La Cime International, Woods Bagot, etc. Commercial property consultants/e-commerce delegates are from Knight Frank, Cushman & Wakefield, JD.COM, Nielsen, iResearch, SF Express Co Ltd, etc. Products & Solution providers are from OPPLE Lighting, Bosch China, Yuanda China, Zebra Technologies, NEC Fielding, Schueco China, Experian FootFall, Winner Information Technology, etc. Media delegates are from Pivot Economic Journal, China Times, China Index Academy, Create Living, dichan.sina.com.cn, focus.cn,etc. On day one evening cocktail party, our exclusive wine partner: Kingbond specially selected 4 series of Caesar Sunshine Wine. 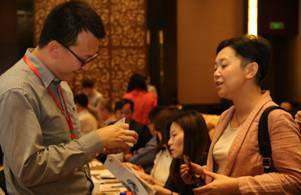 All guests actively involved in wine & food testing, networking and Wechat lucky draw sections. Finally, 9 guests won attractive prizes well prepared from ECADI, Zebra Technologies and IMG3 with warm atmosphere. On the second day of the summit, Mr. Lin Zhu from CITIC Real Estate shared his current PPP business model and illustrated how CITIC Real Estate transform from property development to urban operation through 4 aspects: developer transformation direction, new urbanization , PPP channel and urban operation. Mr. Sven Steiner from SPARK architects started his speech from one of their classical renovation projects: Singapore Clarke Quay and demonstrated their researches & cases in terms of city refurbishment including repair, reuse, reconstruction and reinstall in recent years. Mr. Scott Gao from Patel & Green Architecture let all guests getting out of a misunderstanding zone of façade application and he also emphasized that union mindset of aesthetics, technology and cost can achieve effective control and reduce the difficulty of construction sites. Mr. Liu Gang from 798 deeply analyzed that renovation, improvement and usage of old zones in cities should be alliance with its content and function in order to adapt to the development of the times; he also displayed 798 appearance, renovation site and current situation. Mr. Meng Gen Bao Li Gao from Shenyang Yuanda Aluminum Industry Engineering brought all audience a very booming cross-border & technology driven construction era in the future through application of new materials, new technology and BIM application results for complex and standard projects. Mr. Bryan Chan from The Hub of Shui On Land mentioned the two most important elements of a successful TOD project are connectivity and fulfilled function portfolio and The Hub would be a seamless one-stop life center for office, catering, entertainment, consumer experience, public space and performing arts center since it’s the only one commercial center directly connected with traffic hub in Hongqiao Business District. Ms. Sun Liu Jun from 1912 group traced back the origin and brand gene of 1912 and 1912 group aims to make projects in different cities become these cities’ unique culture card and fashion landmark while mixing local life, culture and business together. Mr. Wen Hong Chang from Opple Lighting dramatically showed a bathroom mirror lighting contrast case which made all participants have a new understanding of commercial lighting: it’s the cheapest way to improve the quality of commercial projects. Ms. Carrie Zhang from IMAX vividly introduced their laser theater technology and IMAX aims to rapidly increase audiences’ viewing experience through continuous R&D of high-tech. Let’s expecting The 8th Asia Pacific Commercial Real Estate Forum --- China Summit 2016!